My good friend Jo has really good taste in food, so I should have listened to her when she told me that Motorino is bomb-diggity. I mean, I heard her, but never made my way down the 25 blocks to East Village to grab a slice of this pizza she's been praising for over a year now. 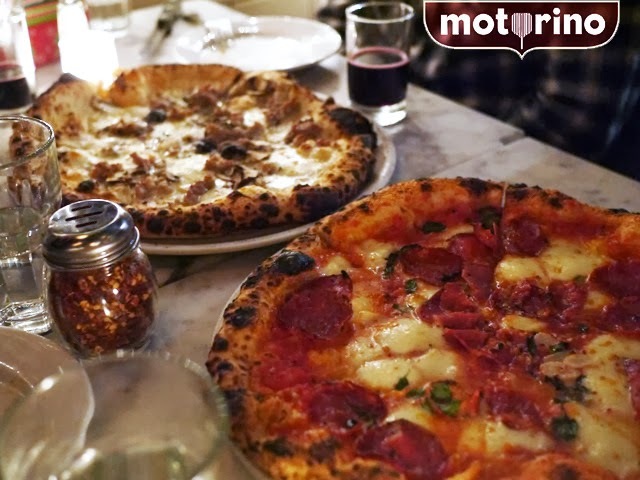 Fortunately, we were in need of a pre-holiday dinner date and Motorino came to mind, and boy oh boy, am I sooooo happy to have finally had a slice. Seriously, it's love at first bite. Each slice is perfectly thin and crisp yet the crust is still a bit chewy and the toppings, mmm the toppings. 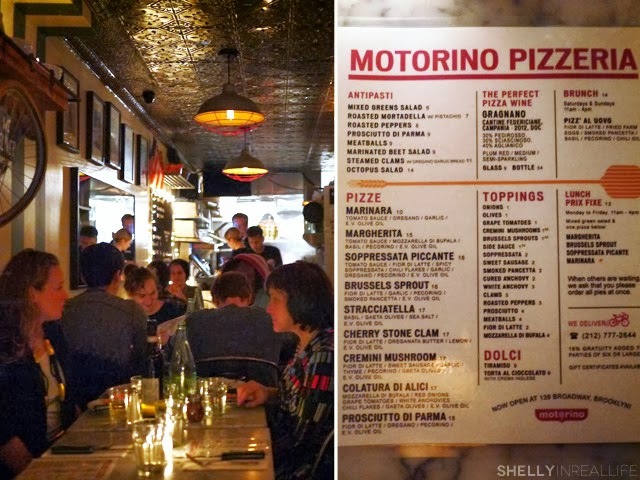 Motorino doesn't take reservations and the space itself is on the smaller side, so make sure you put your name down early. We had 5 people on a Saturday night, put our name down at 7pm and was seated within 30 minutes. But no worries, they take your name down and call you when your table's ready. Get ready... to fall in love. 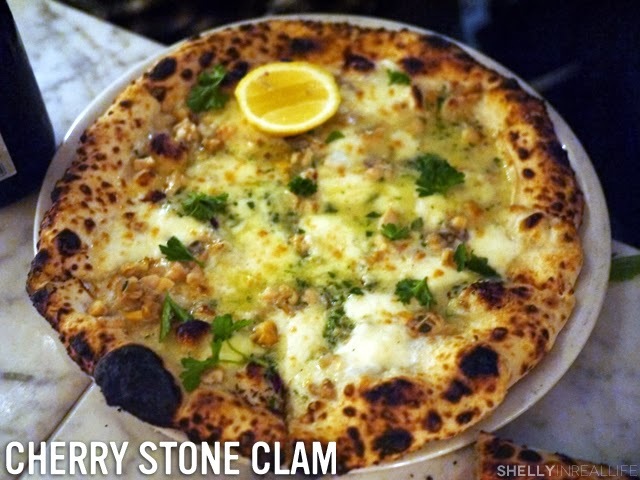 My favorite of the night is the Cherry Stone Clam pizza - a wonderfully creamy pizza with mozzarella fior di latte cheese, oreganata butter, lemon, olive oil and yummy yummy clams. While this was on the oilier side of things, I love the seafood flavor from the clams mixed with the lemon and cheese. I savored every bite and wish I didn't have to share. 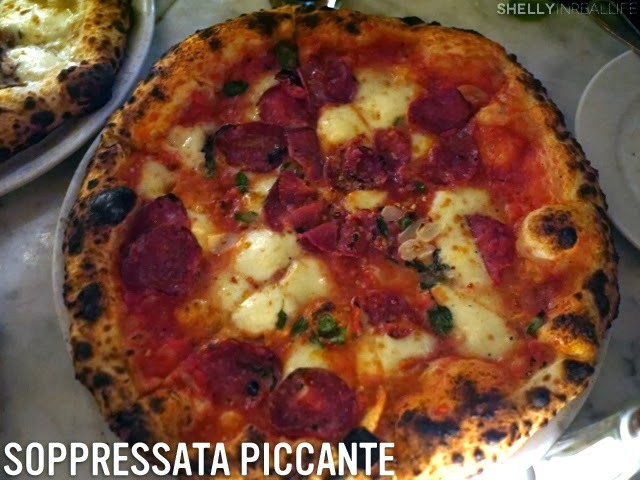 My second favorite of the night was the Soppressata Piccante, their version of a spicy pepperoni and cheese made with a tomato based sauce, mozzarella fior di latte cheese, spicy soppressata sausage, chili flakes, garlic, oregano, pecorino cheese and olive oil. I really loved the slices of thin garlic that was sprinkled throughout the pizza. I would die as a vampire, but here I'm just dying for another bite. 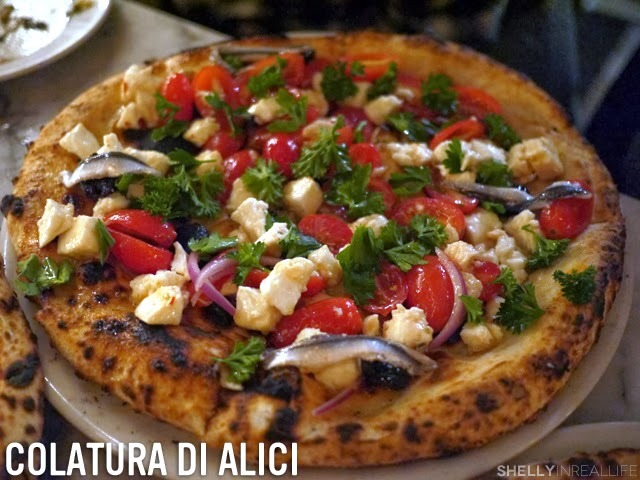 We also ordered the Colatura di Alici which was a pizza filled with fresh toppings in a warm crust - mozzarella di bufala, red onions, grape tomatoes (loved how fresh and juicy this was), white anchovies, chili flakes, gaeta olives and olive oil. I found the balance between the hot and cold very interesting and enjoyed it. J wasn't a fan, and I think I would only order this if there were enough people to order at least the 2 pizzas above this. We also had the Cremini Mushroom Pizza which we picked as a last choice. It was also delish, duh, topped with mushrooms, fior di latte (a popular choice of cheese here it seems), sweet sausage, garlic, thype, pecorino, gaeta olives and olive oil. 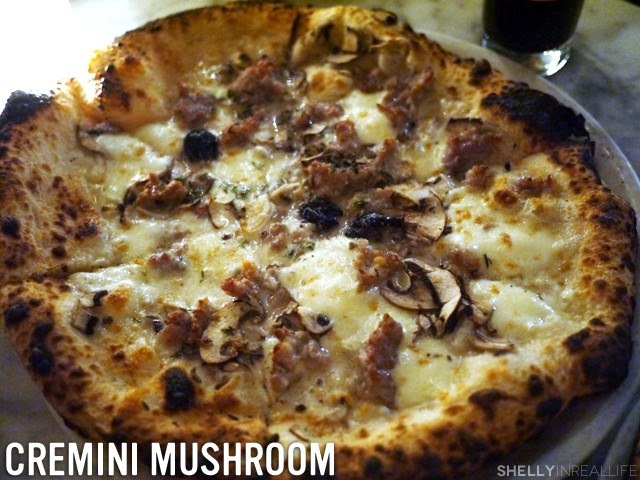 The cream base here is definitely similar to the clam pizza but the mushrooms and sausage provided a different flavor. Given a choice, obviously I would choose the fresh flavors of the Colatura di Alici pizza, but J would probably choose the mushroom although next time I think I'll give the Brussels Sprouts pizza a try. As if 4 pizzas weren't enough, we wanted to order some appetizers/sides as well. In the top right we have the Roasted Mortadella with pistachios which is basically like a seared Italian spam. 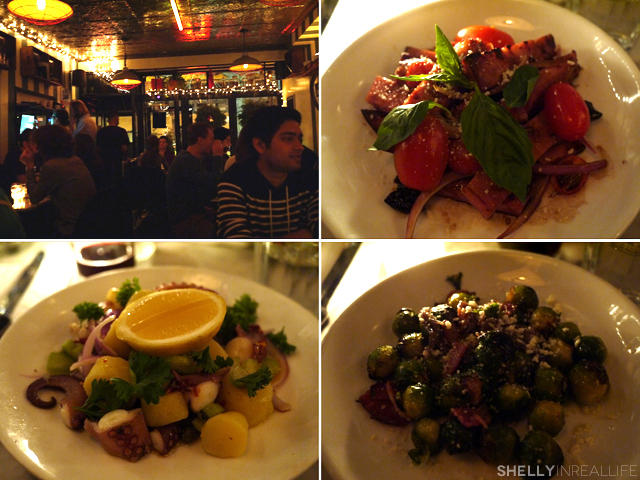 Also ordered the Roasted Brussels Sprouts which is always amazing, as well as an Octopus Salad. We also ordered a bottle of "The Perfect Pizza Wine" which tasted like a sparkling grape juice that's slightly alcoholic. Definitely lighter than any typical wine but fun to drink. At the end of the night, we still had about 1 pizza pie leftover which J and I gladly took home to have for breakfast the next morning. Reheated it in my toaster oven and seriously it was still bites of heaven. Oh, did I mention that they deliver? Must check if I'm within delivery zone.